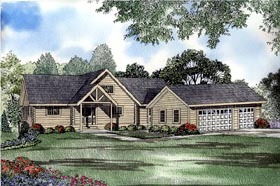 This country log home plan featured by Nelson Design Group has a lovely Covered Gabled Porch leading to the Foyer with coat closet. On the right we have a spacious Kitchen with island and plenty of counter space. The Great room, open to the above Loft, has a fireplace and several accesses to the Rear Deck. Along with Bedroom two, the expansive Master suite, with walk-in closet, has access to the Rear deck. The Master bath has split vanities, corner shower, and whirlpool tub. Off the Kitchen, the Mudroom with ample closet space leads to the Gable Breezeway to the three-car garage.